Every summer we watch campers go from curious to deeply passionate about new interests they discover at Waukeela. This is something we witness in virtually every activity around camp, but perhaps one of the most exciting transformations happens in our colorful art studio. With years of tradition and art surrounding them, Waukeela girls turn their visions into reality and create beautiful art pieces they can always remember camp by. From pottery to painting, each girl is given the time, resources, and encouragement she needs to truly let her creativity run wild! This summer, girls stitched together so many unique fabric creations and learned how to use sewing machines. Our textiles activity gave girls the options to knit scarves, sew pillows, and make special textile postcards. We loved seeing our Waukeela campers think creatively and master new hands-on skills! Surrounded by our beautiful pine forest, sparkling lake, and plenty of smiling faces, our photography campers captured every moment in their own unique way! We were very impressed by all the photographs campers took this summer. Each camper developed their own artistic voice through their perspective, subjects, and color. Mosaic art was the perfect project for girls who enjoy being a little more hands on this summer! Campers learn how to use mosaic tools and piece together unique art pieces that were just as beautiful as they were fun to make. This art activity also served as a relaxing break from outdoor activities and sports during the peak of the summer! Who doesn’t love their tie dye shirts from camp? Tie Dye was one of our favorite messy, colorful, and fun group activities for campers to get to know other girls outside of their cabins. Every tie dye shirt came out different as campers added their own personal touch to their creations. 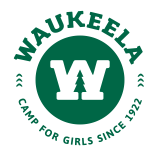 We love knowing that our Waukeela sisters have something special to remember the summer and show their camp pride with! Some of our other Arts and Crafts included painting, clay art, macrame, and jewelry-making. No matter what creative arts activity our campers chose this summer, they improved and learned so many new skills. We can’t wait to return to the art studio this summer for even more amazing art activities! Will we see you there?